Purdue University is located in West Lafayette, Indiana, and is easily accessible from interstate highway I-65. 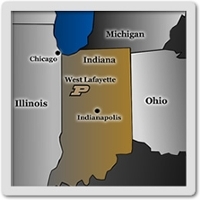 West Lafayette is 100 km (65 miles) northwest of Indianapolis and 190 km (120 miles) southeast of Chicago. The Department of Physics and Astronomy is located at 525 Northwestern Avenue, West Lafayette, IN 47907. Turn right onto IN-43 S/N. River Rd. The closest parking garage to the department is on Northwestern Avenue (PGNW on map, section H-4). Visitor permits for this garage are available for purchase at Purdue Parking Facilities (section C-6). For information about rates and other visitor parking locations, see visitor parking.